⚔ ☢ Serie på seks amerikanske atmosfæriske og et underjordisk atomvåbenforsøg i Nevada forsøgsområdet i den første del af den kolde krig. Oplysninger om operationen er stadig skjulte eller maskeret som klassificeret information også selv om at forsøget er beskrevet detaljeret i Nuclear Weapons Testing at the Nevada Test Site, 2011.. Serien afløste Operation Greenhouse og efterfølges af Operation Tumbler-Snapper. Arkiv: National Archives: Records of the Defense Threat Reduction Agency, (Record Group 374), 1943-73. Se også: Camp Desert Rock , Desert Rock Exercise I, II, III, Nevada Proving Grounds. Se også: Operation Anvil ; Aqueduct ; Arbor ; Argus ; Bedrock ; Bowline ; Castle ; Chariot ; Charioteer ; Cornerstone ; Cresset ; Crossroads ; Crosstie ; Cue ; Dominic ; Dominic II ; Dugout ; Emery ; Fishbowl ; Flintlock ; Fulcrum ; Fusileer ; Greenhouse ; Grenadier ; Grommet ; Guardian ; Hardtack I ; Hardtack II ; Ivy ; Julin ; Latchkey ; Little Feller ; Mandrel ; Musketeer ; Newsreel ; Niblick ; Nougat ; Phalanx ; Plowshare ; Plumbbob ; Praetorian ; Project 56 ; Project 57 ; Project 58 ; Project 58A ; Quicksilver ; Ranger ; Redwing ; Roller Coaster ; Sandstone ; Sculpin ; Storax ; Sunbeam ; Teapot ; Tinderbox ; Toggle ; Touchstone ; Trinity ; Tumbler-Snapper ; Upshot-Knothole ; Whetstone ; Wigwam. U.S. Department of Defense: Exercise Desert Rock (1951). Question. "How many of your men would volunteer to go up and be in the foxholes?" (one-half mile from ground zero). Answer. "I guess about half a dozen." Question. "It's quite a loud noise when that bomb goes off ... would it do them any harm?" Answer. "No sir, not the noise, no." Question. "How about the radiation? Do you think there is much danger?" Answer. "Radiation is the least of their worries that the men are thinking about." Question. "I think most thought radiation was the greatest danger, didn't they? Where did they learn differently?" Operation Buster-Jangle 1951. United States Atmospheric Nuclear Weapons Tests : Nuclear Test Personnel Review, Prepared by the Defense Nuclear Agency. USAF Lookout Mountain Laboratory, Hollywood, California: Military Participation on BUSTER-JANGLE (1951). 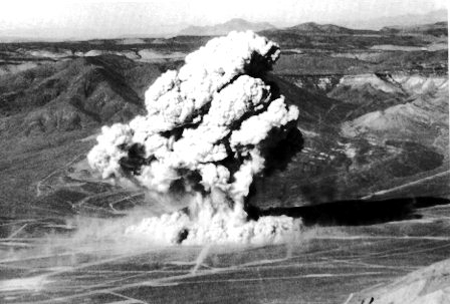 'Operation RANGER was the first continental nuclear test series conducted at the Nevada Proving Ground (now called the Nevada Test Site). With the exception of the Trinity shot in New Mexico, all previous weapons testing was conducted at the Pacific Proving Ground in the Marshall Islands area. From January through February, 1951, five airdrop tests were conducted. Some of the shots were designed to test trigger devices for weapons to be tested in Operation GREENHOUSE scheduled for the Spring: This secret film has been sanitized, with secret portions removed, after the complete version was locked away for decades in top secret vaults, where the unsanitized version remains to this day. The celluloid version of these films are increasingly brittle and very few people have security clearances to view the unedited versions that contain jealously guarded secrets to this day'.